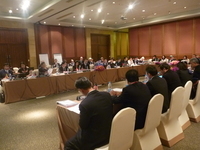 The ADRC participated in the ISDR Asia Partnership (IAP) meeting held on 6-8 September in Pattaya, Thailand. Around 70 participants attended the meeting including representatives from many countries in Asia as well as from the international and inter-governmental organizations. As part of the follow-up to the 4th Asian Ministerial Conference on Disaster Risk Reduction(AMCDRR) held in October last year, the participants shared information on progresses made for the Incheon Action Plan and explored ways to further promote it. They also examined the concept and expected outcomes of the 5th AMCDRR scheduled to be held in October 2012 in Yogyakarta, Republic of Indonesia. Information was also shared among the participants about planned events for the forthcoming International Day for Disaster Reduction (13 October ). Following the IAP meeting, the 18th ASEAN Committee on Disaster Management (ACDM) was held at the same venue on 9 September. The Committee reviewed progresses and challenges of each project and activity under ASEAN Agreement on Disaster Management and Emergency Response (AADMER) and discussed the issues relevant to the further implementation of AADMER in cooperation with strategic partners.